All uniforms and practice gear for the 2018-2019 seasons will be purchased online through The Soccer Factory *Approximately 10-14 days after tryouts you will receive an email from The Soccer Factory that includes a link to the online ordering site. Each indivdiual family will be responsible for purchasing their uniforms and practice gear online. U11-U13 Teams: If you have not received an email from The Soccer Factory by Monday, June 4th email Ashley Frazier at ashley.fendley@challengesoccer.com. Please do not email Ashley before this date. Be sure to include your daughter's name and her team name in your email. U14-U18 Teams: If you have not received an email from The Soccer Factory by Monday, June 18th email Ashley Frazier at ashley.fendley@challengesoccer.com. Please do not email Ashley before this date. Be sure to include your daughter's name and her team name in your email. All uniform orders must be paid for with a credit or debit card. If you do not have a credit or debit card you can either purchase a gift card from The Soccer Factory and use it to make your online payment or you can purchase a prepaid credit card at a local retailer (Walmart sells them). Order Deadlines: U11-13 players must complete their online order by Monday, June 11th. U14-U19 players must complete their online order by Wednesday, June 20th. 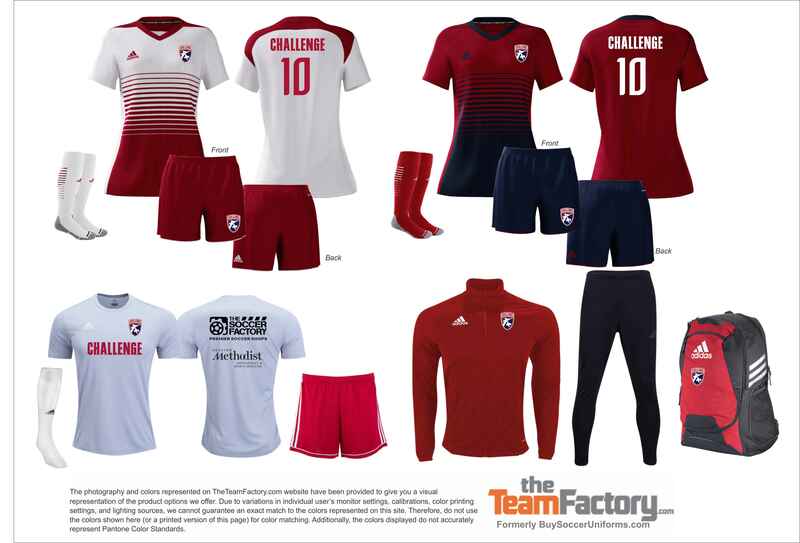 All 05-00 Players from Challenge & Challenge Cypress will go to The Soccer Factory the week of June 4-8th to try-on uniforms. You can go during regular business hours. Challenge Clear Lake & Challenge South - Thursday June 14th from 5:00-8:30pm @ Dow Park; Gary will give each age group specific times within this window to try-on uniforms. Challenge East & Kingwood Uniform Try-on - Wednesday, June 13th from 5:00-8:30pm @ Lindsay/Lyons Park; Coaches will tell each age group specifically what time to try-on uniforms within the 5:00-8:30pm window. ALL players in ALL age groups are required to purchase the new full uniform kit for the 2018-2019 season. The following numbers are available per team(s). No exceptions will be made to this policy. If you deviate from our numbering policy, you will be responsible for the additional cost to have numbers changed and/or the cost of purchasing new uniforms. Players are not allowed to add any customization to any uniform/training item (no names or additional screen printing/embroidery). Players are allowed to have their number embroidered on their backpack, warm-up jacket and warm-up pants on a TEAM basis, meaning either every member of the team does it or no one does it. Families are responsible for the cost associated with any additional embroidery. My family purchased new uniforms last year. Do we have to buy uniforms again this year? Yes, ALL players in ALL age groups have to purchase new uniforms for the 2018-2019 season because we are at the end of our 2-year cycle. Which age group is required to purchase uniforms this year? ALL age groups are required to purchase uniforms for the 2018-2019 season. When will my uniform/practice shirt order be delivered? All orders will be processed and delivered by mid-August. You will likely not receive your order before pre-season camp, but you will receive your orders before the Texas Warm-up Cup (Aug 18-19). Please do not contact The Soccer Factory to check the status of your order over the summer. Challenge Soccer Club will be in communication with The Soccer Factory and will update families accordingly. Do I have to purchase a warm-up jacket and pants now or can I wait until the Fall? Yes, you're required to purchase everything in the uniform package now (May/June). Can I have my daughter's name embroidered on her backpack and warm-up? No, you can not add any customization to any items in the uniform package. This is our policy for a couple of reasons. 1. These are UNIFORM items, and we want every player in our club and on your daughter's team to look the same. 2. It is not safe to put your daughter's name on her bag or warm-up...you do not want strangers to know her name. Feel free to write her name or initials on the inside tag.